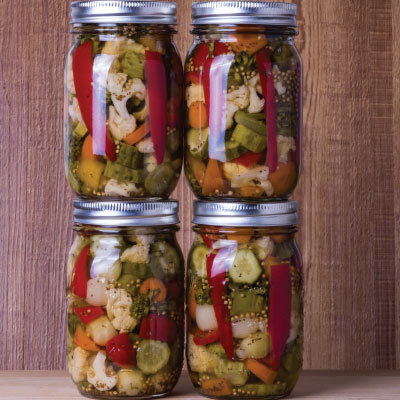 Tip: Sprinkling the vegetables with salt allows excess water to seep out from the vegetables, making the pickles crunchier. Peel the shallots, break the cauliflower into pieces. Peel cucumber and remove soft middle and seeds and dice. Place into a non-metallic bowl. Sprinkle salt over vegetables and toss to coat vegetables in salt. Leave to stand for 24 hours. Rinse vegetables under cold water and dry on kitchen paper. Pack the dried vegetable mixture into hot sterilised jars (see pickling tips for more information), place one or two dried chillies into each jar and cover with vinegar. Seal with corks or non-metallic lids. Leave for 3 weeks before using.